Another successful CicLAvia is in the books. And according to everyone I spoke with, it was one of the most successful, and least spandexed, ones yet. The LA Times offers an early report on the day, along with some great photos. The Daily News also reports on the Valley’s first open streets event — although I hope it was a typo when a police sergeant estimated the crowd at an absurdly low 20,000. Even the New York Times discovered the Valley CicLAvia. 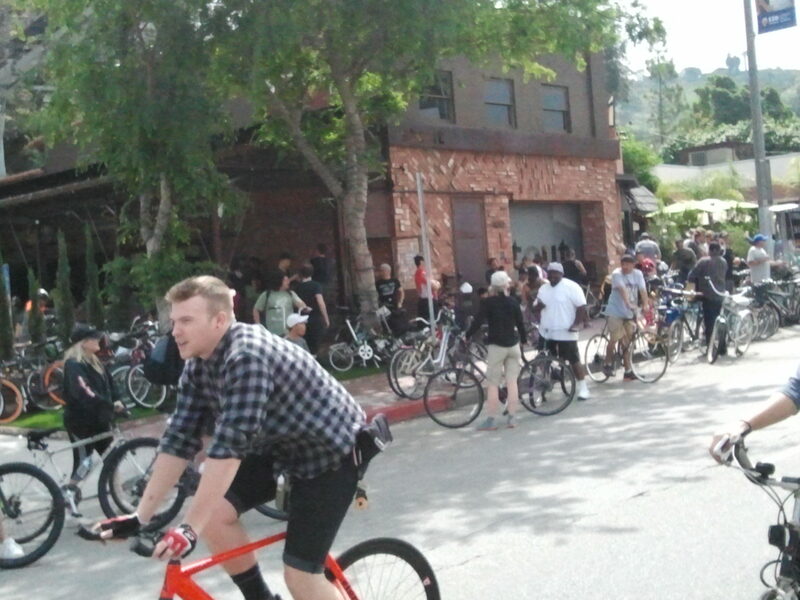 KABC-7 estimates the number in attendance at 50,000, which is about how many bikes were parked in front of Ventura beer and burger bar Stout. KNBC-4 says it could have been as high as 75,000, which still seems low by at least half. 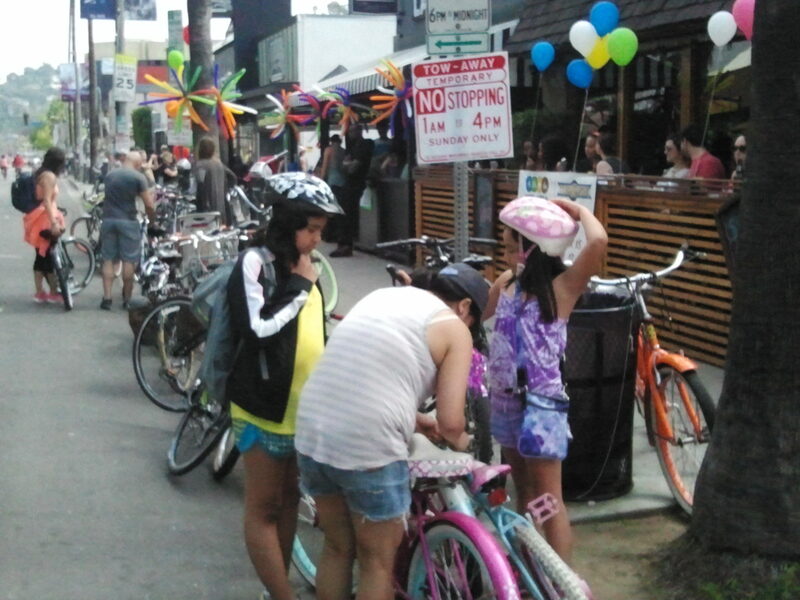 KCBS-2 was worried about the effect on businesses, although from what I saw, many of the businesses that reached out to CicLAvia participants did well. Some — especially food and drink purveyors — seemed far busier than they would be on a normal Sunday. Others wisely took the opportunity to promote their businesses in hopes the passing riders and walkers would come back another day; one pet shop may have a new customer after their sidewalk table caught my eye. Then there were those who chose to close down for the day, effectively offering an FU to the countless thousands passing by. Meanwhile, my favorite overheard comment was from the rider who was surprised to discover that the Valley is just like LA. And that, more than anything else, is what I love about CicLAvia. It gives us a chance to rediscover our own city, in a way we never could by car. And visit parts of this expansive city that some may have never seen before. It also draws a crowd that looks like us. Perhaps the most ethnically diverse event in what may be the world’s most ethnically diverse city, allowing us to meet and interact with people we might never otherwise come in contact with. You see, it’s not just that CicLAvia is changing our streets. And how we see ourselves. 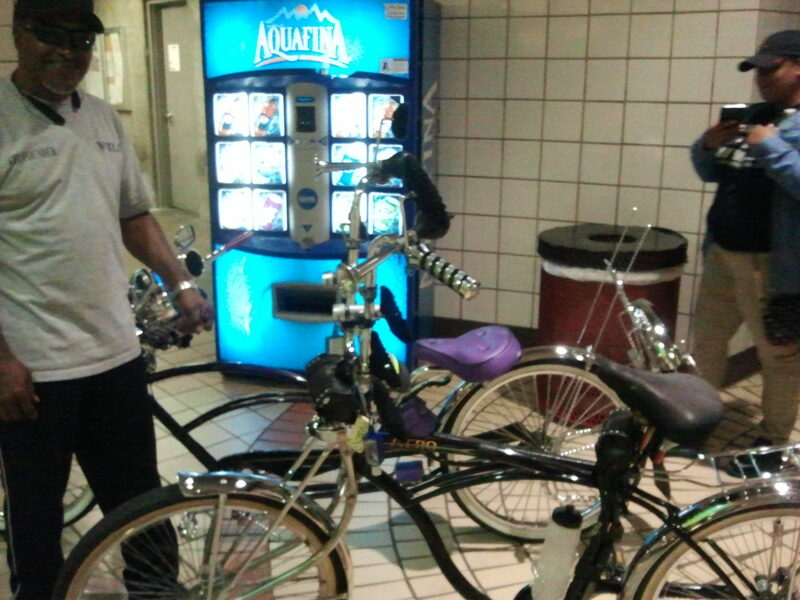 These awesomely customized bikes were waiting with their riders for an elevator at the NoHo Red Line station. These two speed demons kept passing me on my right, and nearly dropping me, as their father ran behind trying to keep up. Many of the participants were children who wouldn’t be allowed to ride on the busy boulevard any other day. 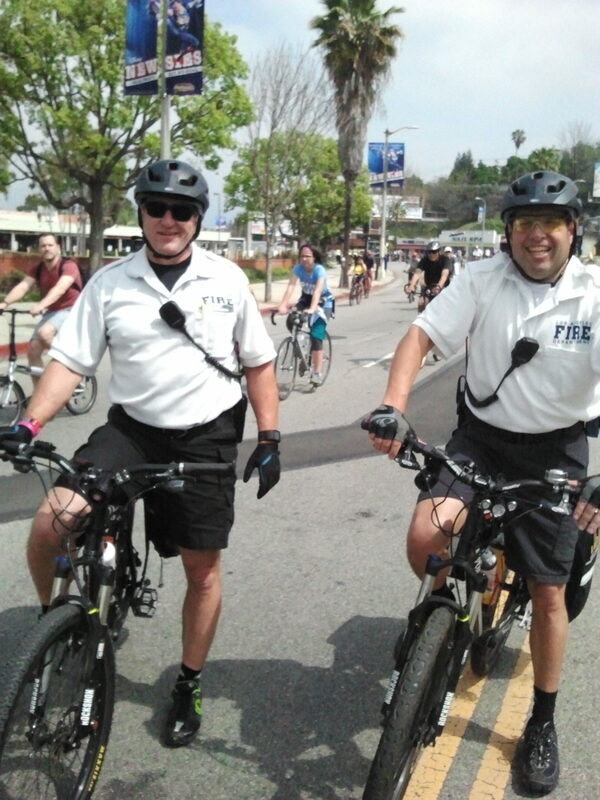 LAFD paramedics were riding to route to provide faster response if needed. 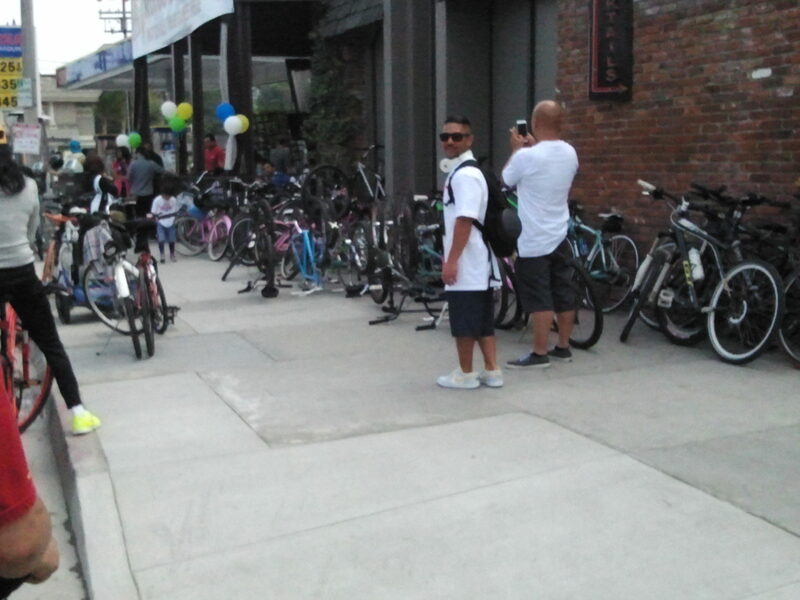 Businesses that reached out to bike riders were rewarded with bikes on the sidewalk representing customers inside. 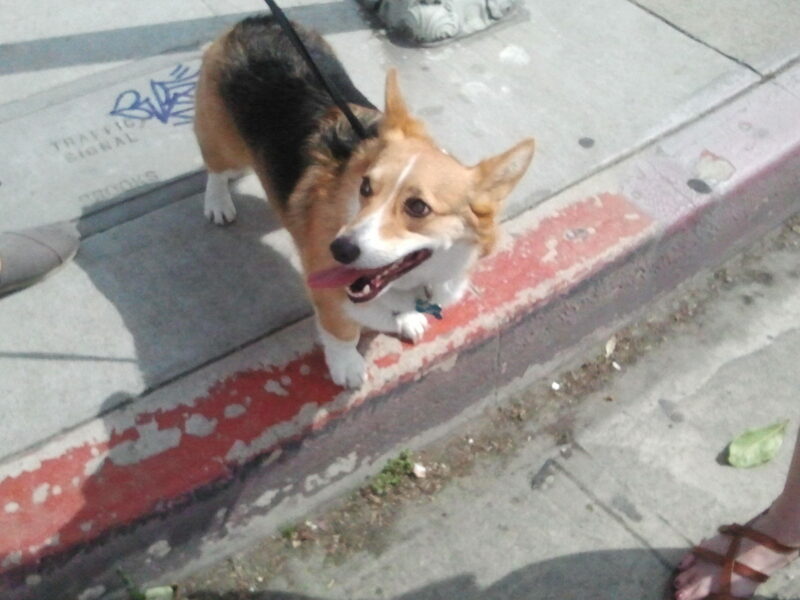 Leave it to me to spot what may have been the lone Corgi in attendance. There’s no better sign of a successful event than bored bike cops watching the crowds, waiting patiently in case they were needed. This looks like a great talk, as LADOT transportation maven Seleta Reynolds chats with former New York DOT commissioner Janette Sadik-Khan at the Hammer Museum on Thursday. The event is free — though tickets are required, and only available at the box office one hour before the talk — and bike parking is available at no charge. A live feed will be available online if you can’t make it in person. Convicted hit-and-run driver William Donald Johnson gets 15 to life for second degree murder in the drunken head-on collision that took the life of Beaumont cyclist Phillip Richards in December, 2013. The judge also tacked on an additional three years for gross vehicular manslaughter while intoxicated and leaving the scene of an injury collision. Streetsblog’s Joel Epstein says this is not your parent’s LADOT; nice to hear how much the department has changed, but we’re still waiting for those changes to show up on our streets. LA Times readers react to the paper’s editorial calling for more study instead of a California bike helmet law. Meanwhile, Calbike pens an open letter to state Senator Carol Liu suggesting what she can do with her proposed bike helmet law. No, not that. A writer for the San Gabriel Valley Tribune explains what it’s like to ride a pedal-assist electric bike. Speaking of Calbike, now you can own your very own shaft-drive bicycle company, lock, stock and trademark. San Diego’s Mission Beach wants bike riders to slow down on the boardwalk. A cyclist is seriously injured going over his handlebars after hitting a rock on a La Jolla roadway; fortunately, he’s expected to recover. Morgan Hill gets its first complete street on a trial basis, which appears to be working despite misinformation in the community. A San Francisco street will get special bike-only traffic signals to protect riders from right turning cars, the second street in the city to get that configuration. Which compares favorably to LA, having exactly zero. The 25-year old Oakland bike rider who had his wallet stolen while he lay unconscious following a collision is finally awake from his coma and talking; a fund has raised $11,000 to help pay his medical expenses. A review of medical journal articles shows what we already knew: bike lanes and bike share programs help fight obesity. A Seattle thief was arrested after trying to sell the bike he stole back to its owner, who had posted a stolen bike notice on Craigslist. Efforts are underway to make Anchorage AK a more bike-friendly city. Cincinnati is rethinking a protected bike lane that no one can seem to figure out. A New York man is suing the city’s bike share program for $3 million after a faulty fender caused him to face plant after flying over the handlebars. Claiming New York’s bike lanes and pedestrian plazas cause environmental damage, a former New York Libertarian candidate files suit to stop them; a similar suit in San Francisco held up the city’s bike lanes for several years. Then again, maybe he’s got a point. Former Olympic Bronze medalist and Tour de France stage winner Davis Phinney — father of pro cyclist Taylor Phinney — is honored by the White House as a Champion of Change for his work battling Parkinson’s Disease. A Baltimore group designs and builds bikes for people with special needs. Britain’s House of Commons will debate stricter sentences for dangerous drivers following the deaths of two cyclists. Maybe they should also consider tougher penalties for bar patrons, after one attacks a cyclist for riding on the sidewalk. Scottish bike riders will soon see another 30 long distance bikeways totaling 500 miles. German imams and rabbis will ride tandems together, accompanied by 1,000 Berlin residents, in a unity ride for tolerance. Maybe tandems could finally pave the way to peace. Three-time RAAM champion Christoph Strasser sets a new 24-hour record, riding 556.856 miles in a single day at a former Berlin airport. Turns out Bollywood megastar Salman Khan is one of us. A Dutch traffic engineer calls on Aussie drivers to get a new attitude, while a cyclists’ political party aims to give riders more clout at the ballot box. Singapore cyclists are accused of road hogging. 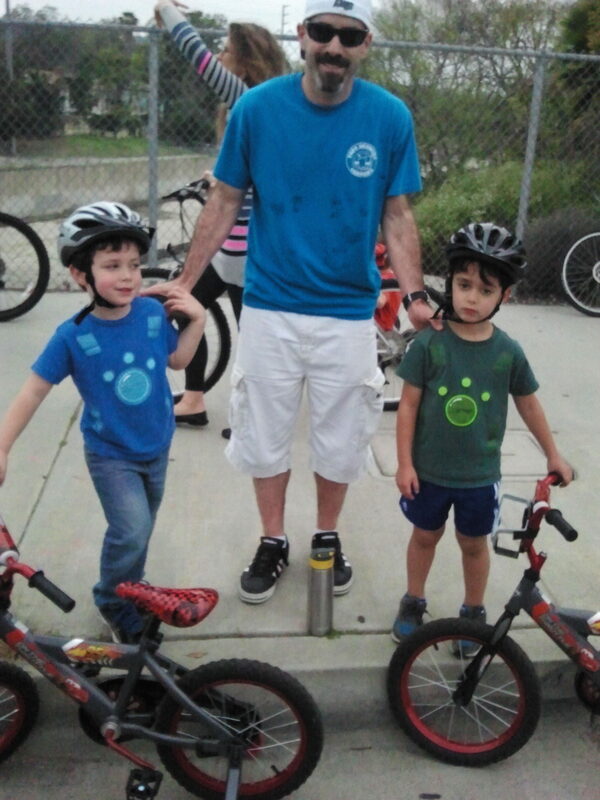 It takes a real schmuck to strong arm a five-year old kid by pushing him off his bike to steal it; big-hearted Sacramento cops and clergy pitch in to get him a new one. A Polish cyclist rode up all 3139 steps to the top of Taiwan’s 101 story Taipei 101 building, the world’s tallest building until just five years ago. And former pro football player Kellen Winslow Jr. is determined to dominate pro cycling; he’ll need to ride a lot more than 60 miles a day, and weigh a lot less than 215 pounds, just to make the peloton. Let alone win. bike the review of a at current interest rates well under a dollar day to finance vehicle is an invitation for next weeks followup about how to spend the saved loot making it a informed choice, for those of us who spend more then a dollar on mobility a day already at least. See we have the right to spend another five bucks or more per day if we choose of our own tax dollars on lockers, lanes, valets, or deep dish vegan delights even. We are part of the people. Unlike owners of the i8 who pay almost nothing of what they spend for infrastructure they may gobble up with it, we are not on welfare, at all, but rather too heroic presently. We have faces, and must not be forced to don helmets, or be lied to about the power of organizing ourselves to make electric bikes the only bikes worth sharing. For all the criticisms regarding it being bruising or impractical concern hoarding, not using, human scale vehicular technology. Obviously a good shared bike must include a manual only operation simulation mode, but last night a car with a gps unit demonstrated how leaving out the part that shuts it down should be criminal, as police had to drop back and only watch it nearly kill for far too long. Puhlic infrastructure must be balanced. Providing for mobility in cities means even lower bonding costs now allow for batteries used to start airplane engines being usurped instead to augment our muscles despite costing hundreds of dollars. The fact that prop airplane owners have literally been flying batteries made of lead weighing more then many bicyclists and there bikes combined, in fact if you add the extra fuel consumed by the extra weight of lead versus quality ingredients, more in just that difference alone, you see how individuals need governance to be led away from madness. Beating enough air past man made wings to fly is noisy and expensive, yet we do it that crudely still. Soon enough of us to matter will not own even worse contraptions known as cars, which also are said to need to get the lead out, depite having wheels, and working far better on lead then more expensive chemistry because of a shortage of manufacturing or whatever- the point is that the commons should be fed first, those on the ground, not in the air, or trapped in vice, with entire heavy wheels just to steer, somehow not extinct, despite being awesomely worse then ebola and all other disease, to grossly understate the Nazi like presence of the AAA etc. in OUR congress and worse. Trains have parking lots because of the AAA, and so almost nobody uses them. Lead is legal to fly on because the club that does so is small, connected, crazy drunk on our dollars they pretend to own. We have to fight for years to get cost effective nylon fabric belts not being considered an extra cost premium in the past, and now are so beaten down resist the idea that pedal assist should be standard on any transit purposed public bike drive train, in fact most of us will encounter the wuedtion first in this comment. Question. Defective by design, insane if on naked human power only, is any solution built for all. The ADAis reason enough to require pedal optional technology be the rule, not for busses, but bikes, instead of the other way as presently suffered. Boats carry anchors, some do, most don’t, planes should not, bikes must not, the anchor is not the battery, it is isolation, renegade status, as impediments to gouging by the Fords of our families forever now. Overcoming is overdue, and anyone wealthy enough to own a smartphone is evil embodied to even lust for a personal car. Yet Santa Monica high will graduate another class of them in a matter of weeks, and the napalm and other torture implements to enable there treachery is backordered and stored in our foreign bases ready for inevitable abuse, in our names and voluntary it is argued hands. Such is the profit of stealing souls from Angels. wait, the comment above needs their own blog, really? Anyhow, We rode Ciclavia. We had a great time. One issue, the center Hub had many issues, it should have been split into eastbound, north bound traffic across the parking lot on opposite sides. Then to funnel out all those people on one little driveway? Also they should of had more Portapotties along the way as 10-20 portapotties for 100k people crossing the center hub was quite an issue. 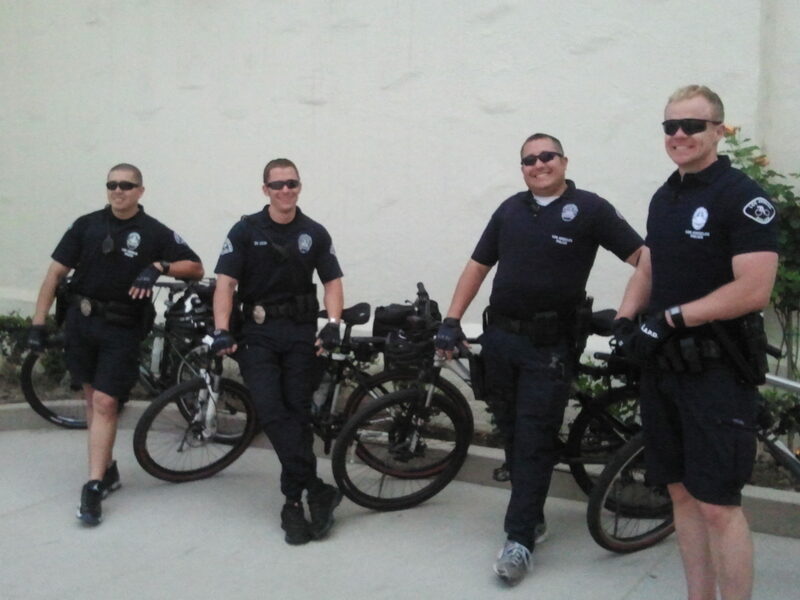 The police presence was great and an I applaud them being on bikes as well. 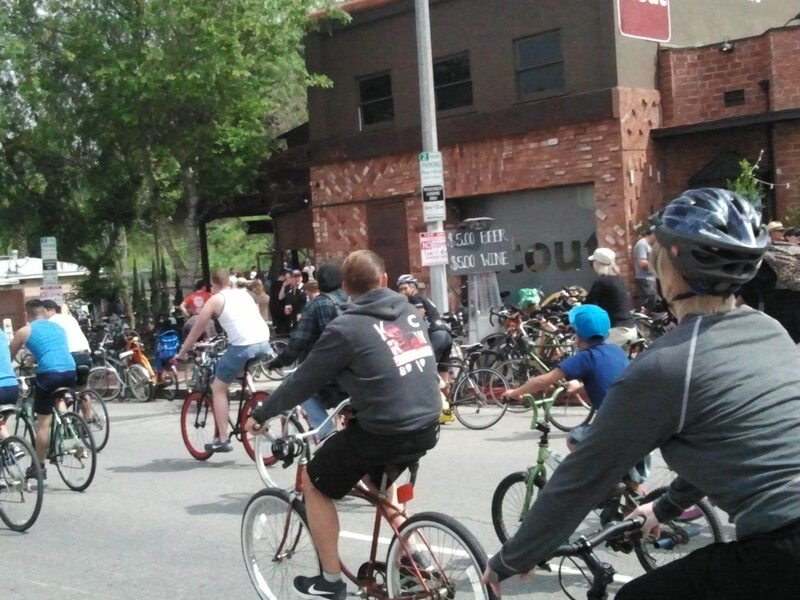 One other note, If Ciclavia is supposed to promote local businesses as well. Why all the hipster food trucks at the Hubs? We actually ate a local restaurant on Lankershim that was a brick and mortar store. Called Vicious Dogs a great Hot Dog shop. We appreciated the Militant Angeleno blog’s suggestions. This message (including any attachments) is only for the use of the person(s) for whom it is intended. It may contain Mattel confidential and/or trade secret information. If you are not the intended recipient, you should not copy, distribute or use this information for any purpose, and you should delete this message and inform the sender immediately. Maybe worth mentioning, said the sluggish recumbent rider: That new 24 hour distance record for an upright road bike is still 235 miles short of the human powered vehicle record set by Christian von Ascheberg in 2010.